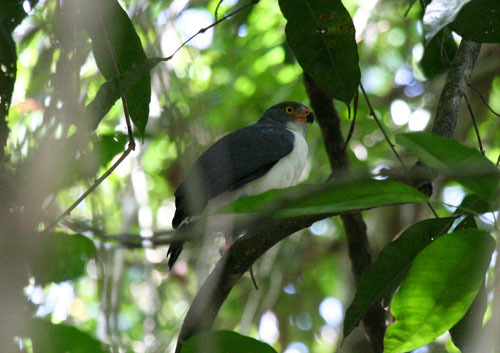 We spent three nights at Canopy Tower and then we were driven in a Canopy vehicle to the sister birding camp, Canopy Lodge. This took about 3 hours. Canopy Lodge is located west of Panama City on the line between the Chocle and Panama provinces (or whatever the governmental divisions in Panama are called). 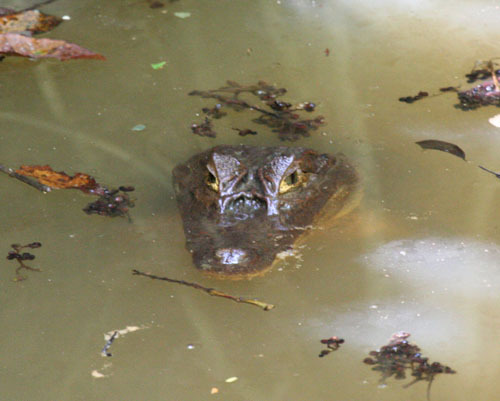 The location is higher, cooler and, at least while we were there, wetter than the area nearer Panama City. The countryside is very beautiful. We were not aware how hilly and mountainous Panama is away from the coast line. 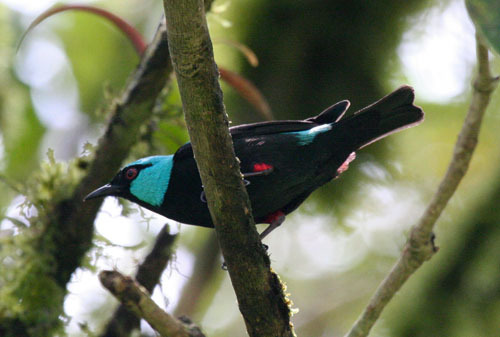 Canopy Lodge is located in the El Valle area, primarily foothill forests . For many years, this has been a week-end retreat for residents of Panama City seeking to relax in a quieter, cooler and drier clime. 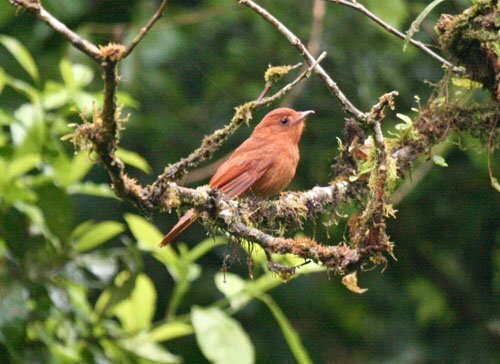 House Wrens, White-tipped Doves, Red-legged Honeycreepers, and, on the last day and much to our surprise, a strikingly plumaged Rufous Motmot. Our guide here was Moyo. He is knowledgeable and enthusiastic. 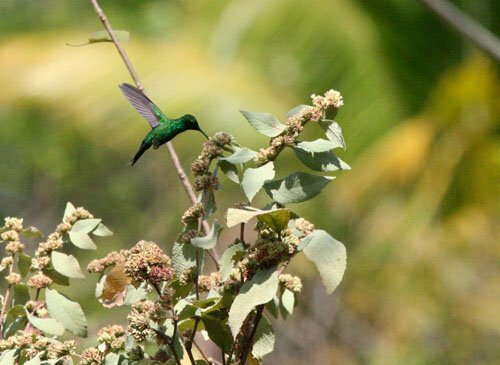 As at the Tower, the guides at the Canopy Lodge are simply amazing in their knowledge of the local flora and fauna and in their enthusiasm in showing it all to their guests. We normally left with our guide after breakfast, about 7:15 and returned in time for lunch at about 12:30. After lunch and a siesta, or a walk around the grounds, we would go again with our guide about 3:00 and return at around 6:00. There are various routes that can be covered, and we were not there long enough to take them all. 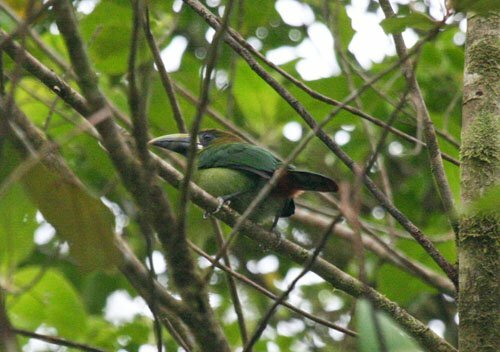 and a Blue-throated (Emerald) Toucanet. 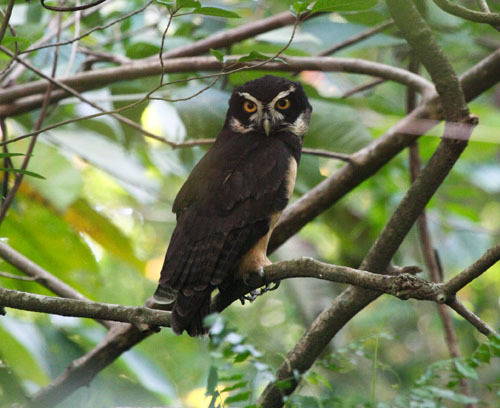 My favorite spot of the trip was the lovely and rare Spectacled Owl. 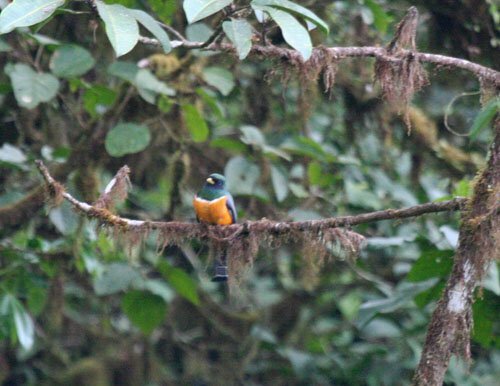 We saw five of the six Trogons that can be seen in the area (missing only the White-tailed Trogon), all of the five Manakins and all of the four Motmot species. 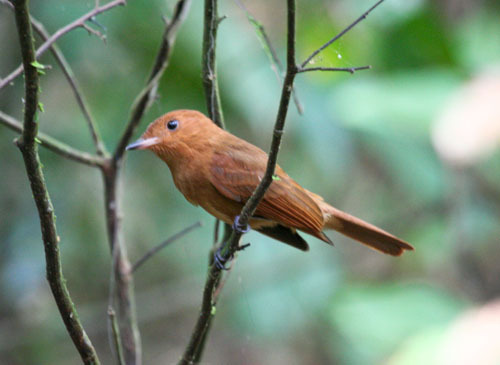 We saw a good sampling of the Antbirds, Antshrikes, Antwrens, Antthrushes and Antpittas the dwell in the forests of Panama. Other families well represented were the Wrens, Tyrant Flycatchers, Hummingbirds (we saw 11 species), and Woodcreepers. 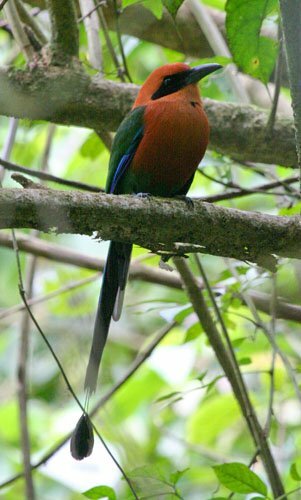 Surprisingly few were the Parrots and Parakeets. 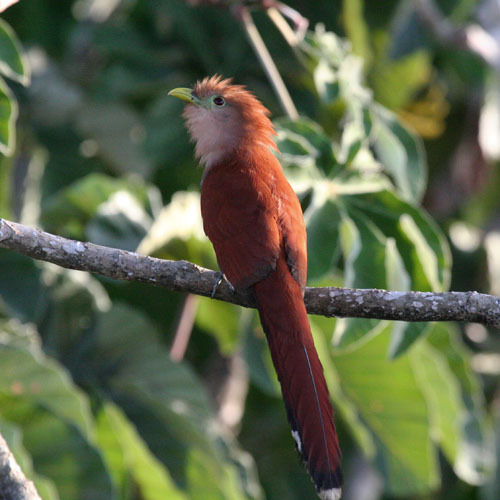 My final Panama bird tally was 81 new species and 211 total species. 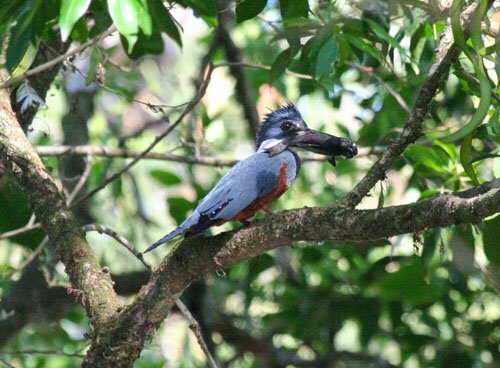 Panama is a beautiful country and it is great for birding. Anyone who has the opportunity to go there, should. 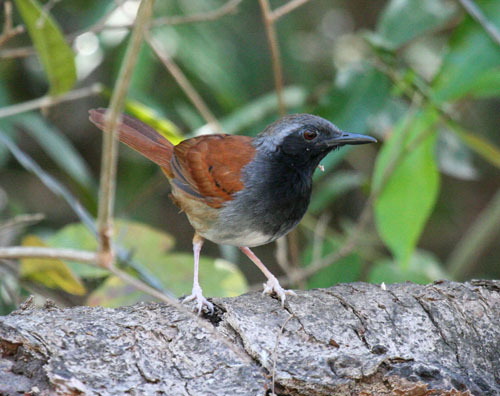 There are many more areas of the country that could be explored with equally bountiful numbers of species. Canopy Tower is an abandoned U.S. Army radar station, built like a very wide silo. 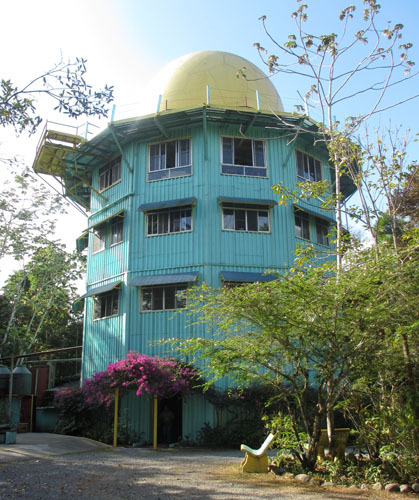 When the military abandoned it, it was converted into a destination birding site with rooms and common areas for 20 or so guests, great views of the surrounding jungle from the top of the Tower and excellent guides to help guests identify the numerous Panamanian species that can be found in the area. We spent the afternoon and the next 2 days on guided tours to various sites in the vicinity of the Tower, including the famous Pipeline Road. 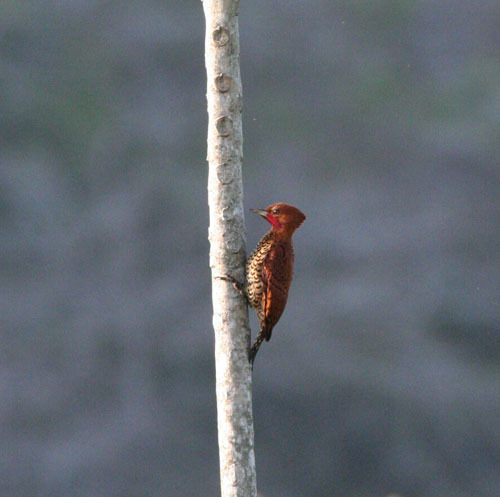 The most colorful birds that we saw well from the Tower itself were the Cinnamon Woodpeckers. 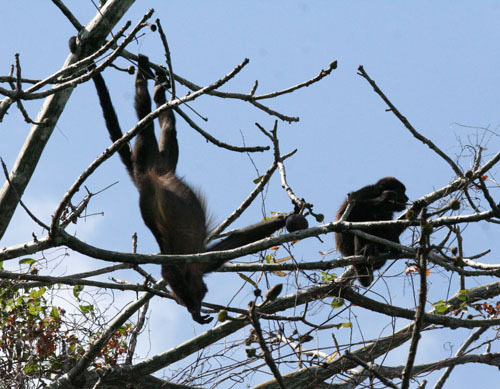 Early every morning we were awakened by the howling of the Howler Monkeys, which occasionally came very near the Tower. 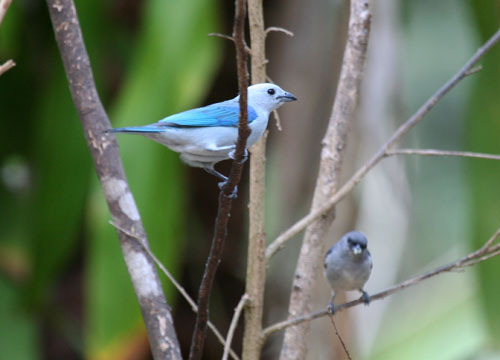 Blue-gray Tanagers were the most numerous of the many species of tanagers that we saw. 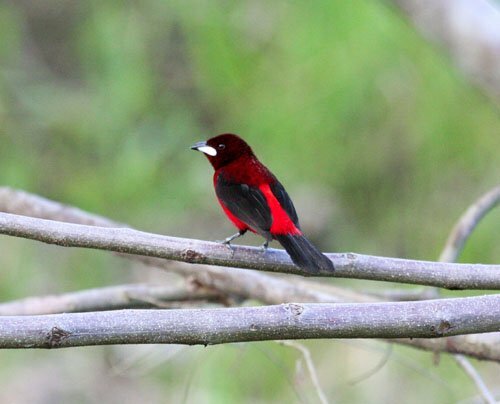 Crimson-backed Tanagers were among the most colorful and were also quite numerous. 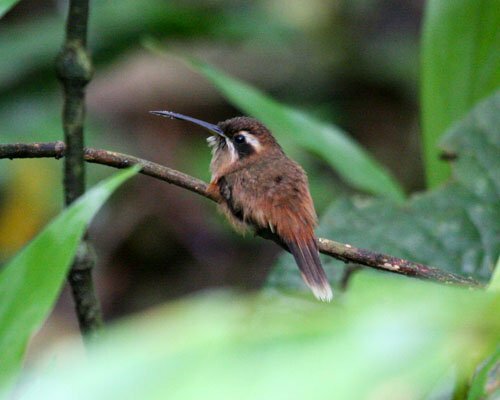 One of the least expected finds for me was the strangely named “Brownish Twistwing.” The name comes from its habit of constantly twisting first one and then the other of its wings. 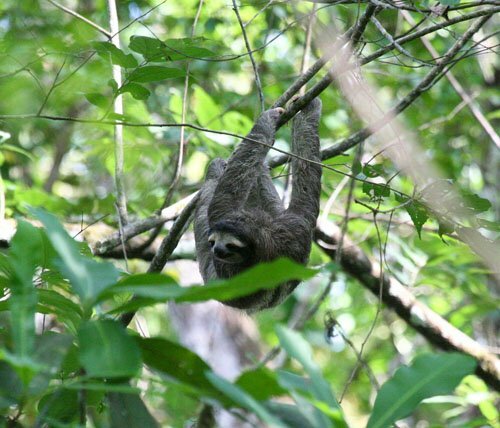 We saw several slothful Brown-throated Three-toed Sloths, resting motionlessly high in their tree-top perches. We later saw several of the somewhat larger Hoffman’s Two-toed Sloths, but they were curled up and motionless and never exposed their more memorable features sufficiently to get a good picture, unless you think an amorphous mass of gray hair is of interest. We learned that the Pipeline Road was built to supply oil to the Canal through a pipe laid along the road, which has never been used. 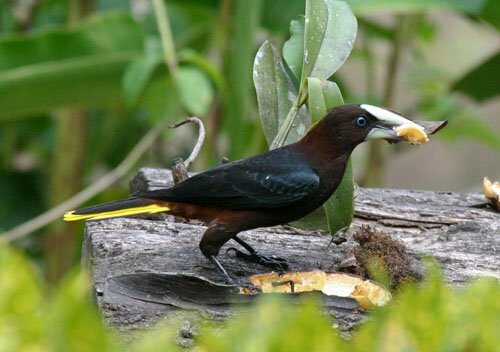 The road does provide a nice running track and nature trail, and is known world-wide for the variety of birds that can be found along it. 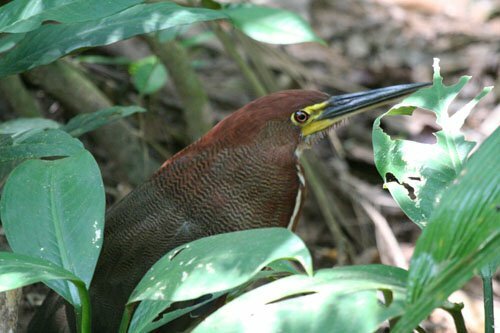 and a Bare-faced Tiger Heron. 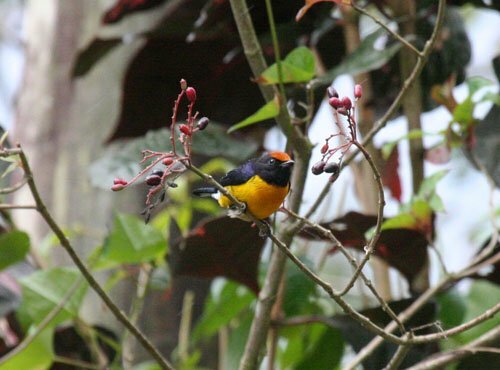 From Canopy Tower we were taken by van to its sister facility, Canopy Lodge, on the border between the governmental departments of Panama and Chocle, for three more days of birding and general nature appreciation. I will describe the Lodge and what we saw and did there in my next installment. 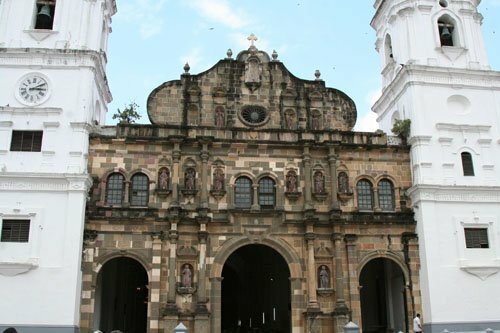 Barbara and I arrived at Panama’s Tocumen Airport about 10:00 p.m. on March 7th where we were met at the baggage area by a driver arranged for by our hotel, the Radisson Summit Hotel and Golf. The ride to the hotel was quite long, but it was worth it because the Summit is a lovely place and is not very expensive, especially if, like us, you do not golf. 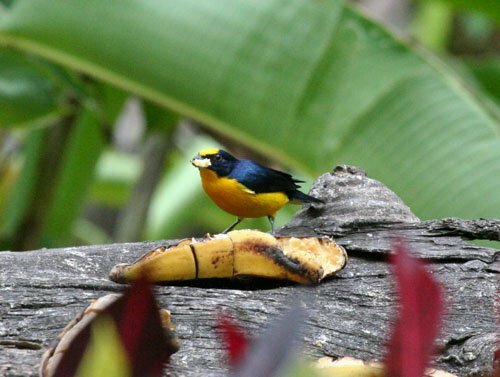 We enjoyed our first night, breakfast the next morning, and a little early morning birding around the expansive hotel grounds before hitching a ride on the hotel’s van for a mid-morning and early afternoon walking excursion in the Old City. The Old City was cramped but interesting. We walked around for a couple of hours. 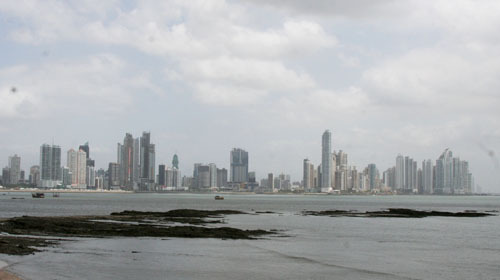 We had a good view of the skyline of the new Panama City across the harbor. It is very impressive, with some of the most spectacular high-rise architecture that we have seen anywhere. 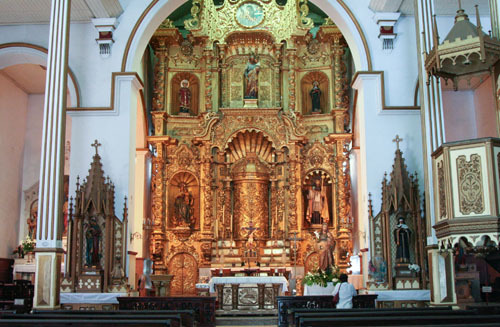 We visited Iglesia of San Jose with its spectacular golden altar. We quickly left the cathedral when we became aware that a funeral was about to begin. The entire area is involved in a great deal of renovation. The completed structures are stunning. We took a taxi from Old City to Miraflores for lunch and an afternoon watching the great ships (the “Panamax” vessels) ease through the Canal, never on their own power, but towed by several cable machines. 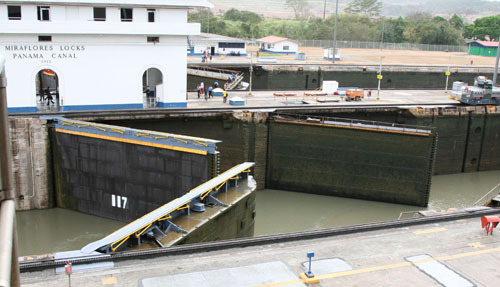 The clearance between the sides of the ships and the sides of the Canal could not have been more than a few inches. Across the Canal we saw the dirt-moving and other activity involved in building a parallel and wider Canal to accommodate the even wider ships that are now being produced. It is projected to be completed by 2014 for the 100th anniversary of the Canal. The Canal is still one of the engineering wonders of the world. The French started a canal in 1880 under the direction of the builder of the Suez Canal, but after 20 years of struggle, they were forced to give up. In 1903 Panama seceded from Columbia and the US signed a treaty in which the concession for a public maritime transportation service across the Isthmus was granted. The following year the US purchased the French company’s properties for $40 million and began to dig. On August 15, 1914, a US cargo ship made the first transit. 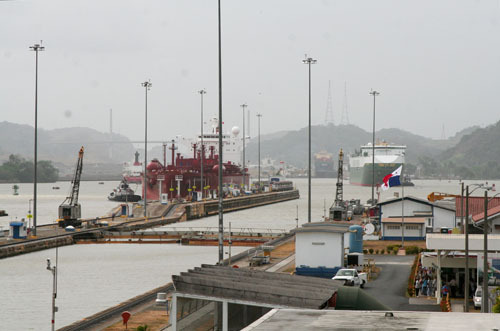 In October 1979 the process of handing the Canal to Panama began under treaties signed by President Carter. The Canal is about 50 miles long and ships are lifted 85 feet in three locks as they cross the Isthmus. 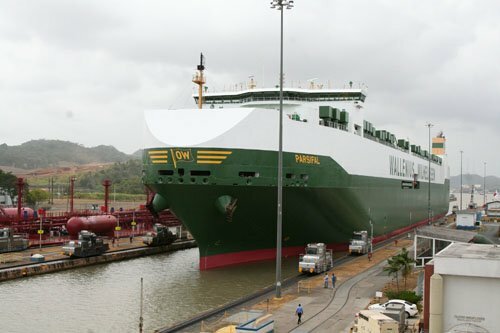 The journey through the Canal takes about 8 hours and a ship is normally in Canal waters between 14-16 hours. From Miraflores we took a taxi back to our hotel and later we were met there by friends from Panama. They drove us back down town to the new city and we thoroughly enjoyed a very lovely evening with them at one of their favorite neighborhood restaurants. The next morning the Canopy Towers van picked us up at the Summit Hotel and drove us the short distance to Canopy Tower. Day 10 we left Kensington Tented Camp for a day in the Serengeti on our way to our last camp, Olakira Tented Camp. What a day it turned out to be. 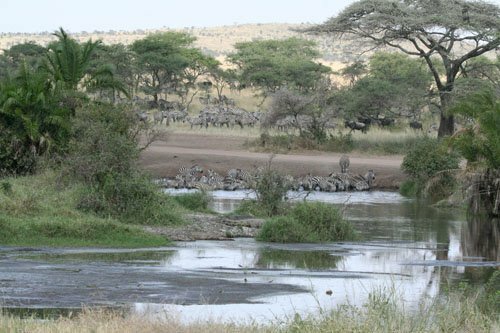 Very soon after entering the Park we began to see and hear hundreds, then thousands, of moving Zebras, now accompanied by an equal or greater number of Wildebeests. The Zebras were very loud, some braying and some barking. As far as we could see, for hours, the grasslands were full of moving animals, heading north toward better grass and water. The numbers were amazing. 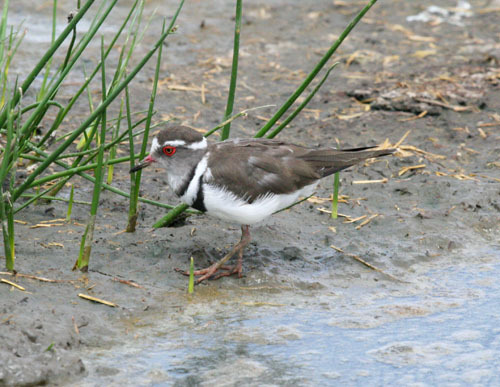 I have no idea how many we saw on the move that day, but it had to be in excess of 100,000 of each of the two species. This was what we most hoped to see in the Serengeti, and we were very fortunate to be in the right place at the right time to witness this great migration of large animals through the African grasslands. 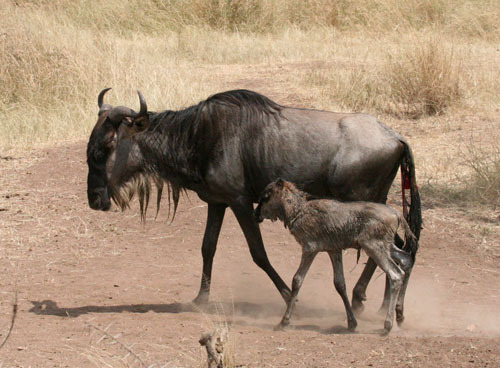 The Wildebeests were early in their birthing process here in the Serengeti, unlike at Ngorongoro Crater, where a few days earlier most of the females had calves in tow. Here, very few had yet given birth. One of the early arrivals, wet from the birth process and with umbilical cord attached, was up and running with its mother, who still carried the afterbirth with her as she joined in the march northward. Lions, Townsend’s and Grant’s Gazelles, Topi, Hartebeests, a few Waterbucks, our first diminutive Steenbok (about the size of the little Dik-Diks that we had been seeing on a regular basis). This is prime time for the predators. 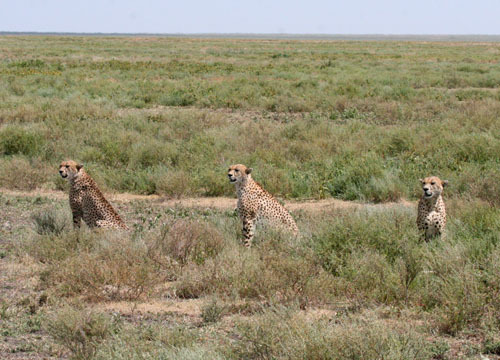 Among the most interesting of these were 3 beautiful Cheetahs, probably 3 brothers, that were on the hunt. 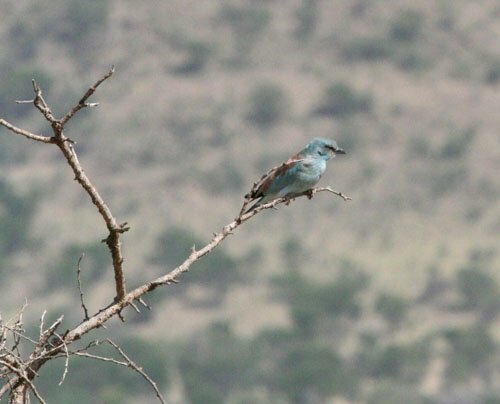 We watched for quite some time as they stalked a small herd of Wildebeests, with no success. As they watched their intended prey move away, the brothers decided to take a break and bask in the morning sun of the Serengeti. 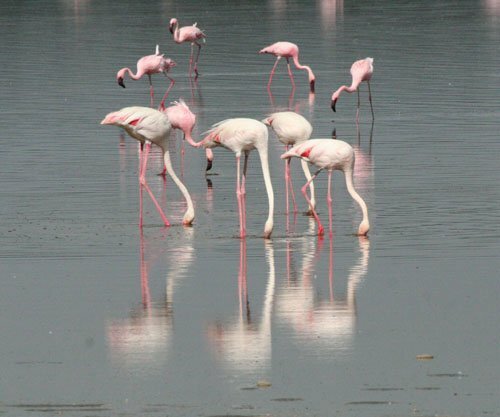 We were able to get a close-up view of both Lesser and Greater Flamingos feeding in a shallow lake. 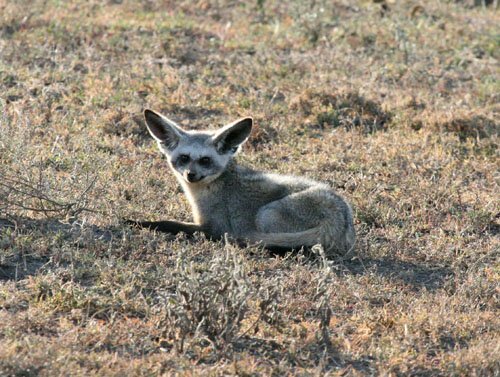 A pair of Bat-eared Foxes were enjoying the late afternoon sun along the dirt track. 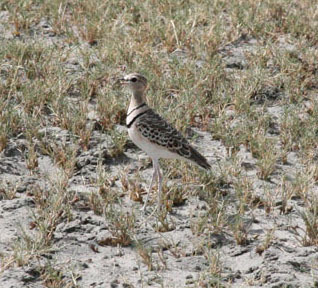 This Two-banded Courser was walking through the grass. 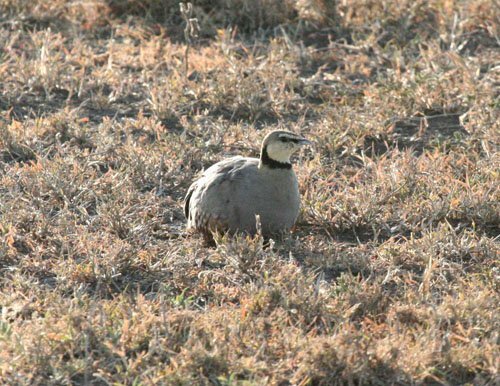 We saw all 3 of the Sandgrouse species that can be found in northern Tanzania. This one is a Yellow-throated Sandgrouse, which was the most numerous that we saw. 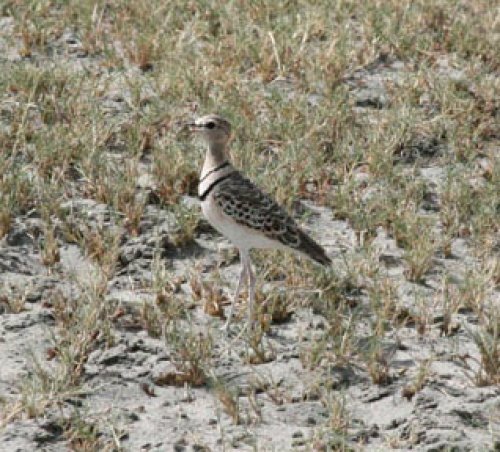 The Sandgrouse family is especially interesting to me, especially their ability to find water in deserts, and to survive in such harsh, dry conditions. We arrived quite late in the day at Olakira Camp. We were pleased with this facility. 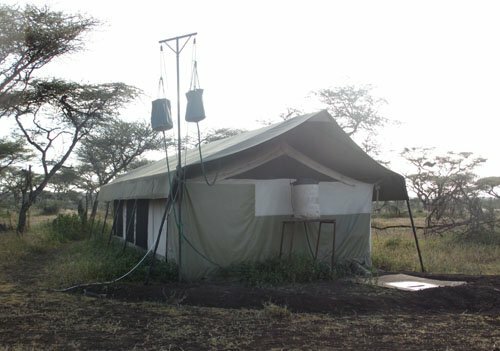 This picture shows the “shower” system: a couple of bags suspended above the tent, which would, upon our request, be filled with hot water by camp personnel. The next day we saw more of the same types of animals that we had seen on our trip the prior day. On our final morning we focused on trying to find Elands, Africa’s largest antelope. 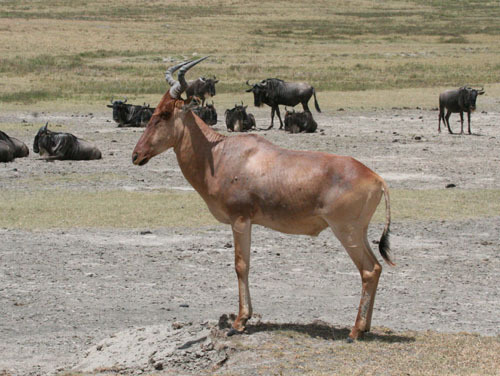 This was the one remaining species of antelope that we had not been fortunate enough to find on the previous days. 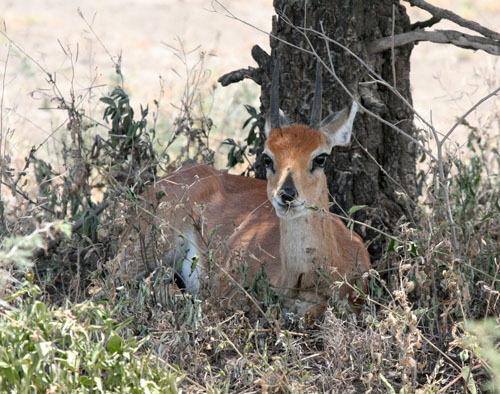 Although Elands had been seen in the area in prior weeks, it seems that it had become too dry for them and they had moved on and we did not find any. Our flight from the Serengeti to Arusha was late, and as a result we were very tight on time to transfer by car from Arusha to make our flight at Kilimanjaro. With the help of one of the Kensington drivers, Jimmie, we made it with a few minutes to spare. We were very pleased with our Safari in Tanzania. The people were cordial, the country side was spectacular and the bird and animal life was abundant and at times dramatic. Our lodging was suitable and the food was excellent. We recommend it to others. This was Day 7 of our safari. Raymond picked us up at the Coffee Farm after an early breakfast. We have a long drive ahead of us. 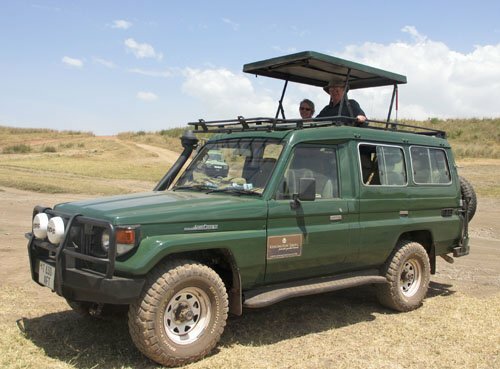 We will leave the Ngorongoro Conservation Area, driving northwest, and enter the Serengeti with a stop at the Olduvai Gorge. 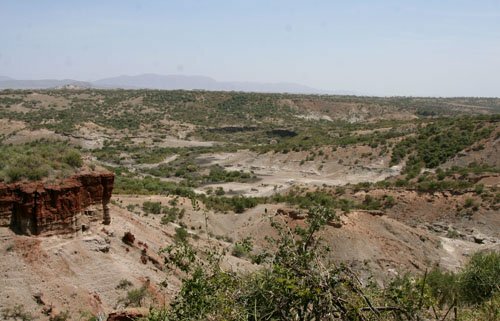 Sometimes referred to as the “Cradle of Mankind”, this desolate and dry plateau marks the place where the Leakeys discovered the oldest known footprints of human beings. Many believe that this is where humanity first evolved. Over the next many millennia, humans spread northward into Europe, across Asia, into North America by way of the narrow channel between Siberia and Alaska, and thence south and east throughout North and South America. We liked the Visitor Center displays, which provided a wonderful pictorial of the presumed changes in the Gorge over many centuries and the spread of mankind. I also enjoyed a few minutes of quiet reflection on a wind-blown bench looking down over the Gorge. Centuries of erosion expose many layers of vari-colored rock and sediment marking the historic, one could say cataclysmic, changes that the Gorge has undergone. When we were satisfied with our visit to the Gorge and its Visitors Center, we quickly ate our box lunches before embarking into the Serengeti. 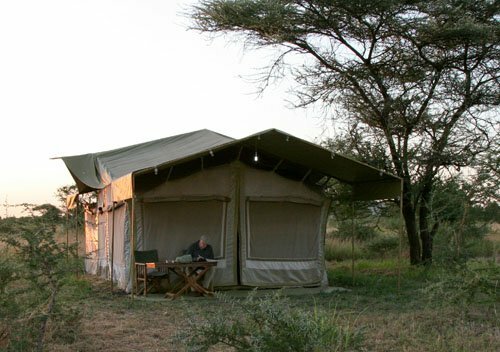 We expect to be on the road for about 6 hours before we reach our camp for the night, the Kensington Tented Camp. 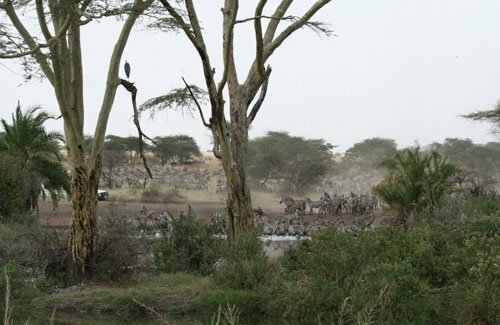 This Camp lies just outside the Serengeti National Park, by the west-central part of the Tanzanian portion of the Park. As we enter the Serengeti, we note the dryness of the landscape. Even where there is ample grass, it is mostly brown. The road is dusty and the wind is always blowing. We protect ourselves from the dust of other Safarists as best we can, with Raymond ultimately breaking the turning mechanism on his driver’s side window as he constantly cranked it up for protection from dust and down for protection from the heat. There were some stranded vehicles here and there with efforts being made to revive them with fluid or pumped up tires. The courtesy of the driver/guides to one another was notable, with the exception of one particular company, whose vehicles invariably charged by at a high rate of speed with dust billowing in all directions. This is what we were hoping for. 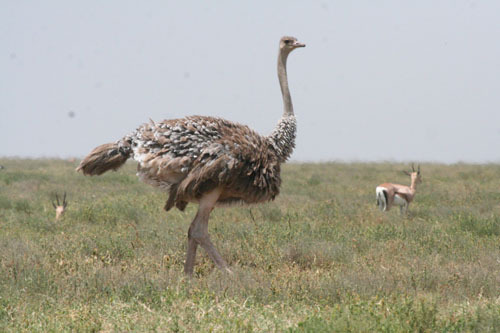 Animals abound, often in mixed groups, such as Ostriches and Thompson’s Gazelles. 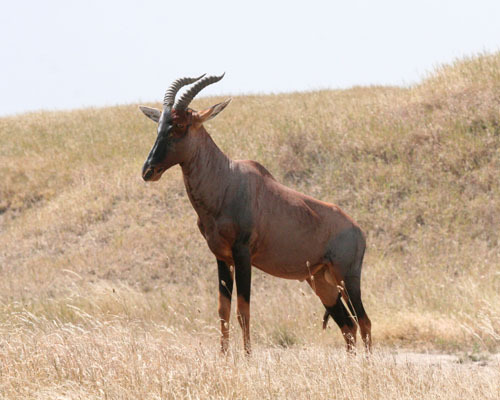 We see the graceful Hartebeests in several locations. 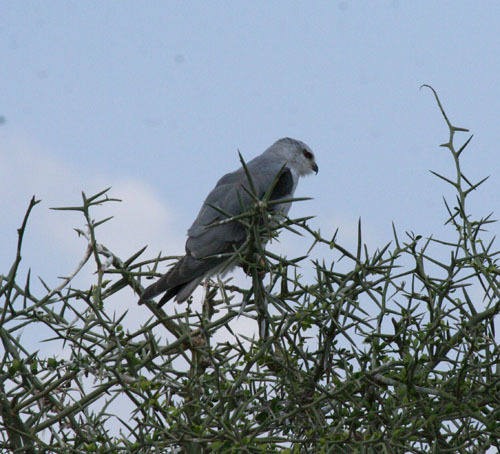 The first of several lovely little Pygmy Falcons perches near the road in an Acacia Tree. 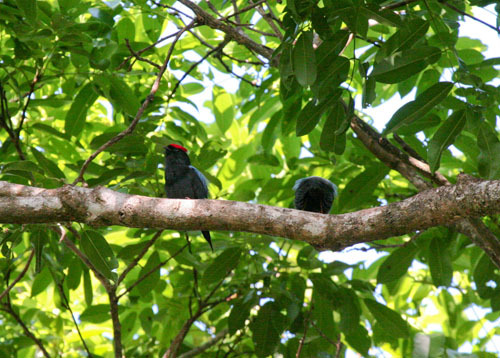 Topis occur sporadically on the landscape. 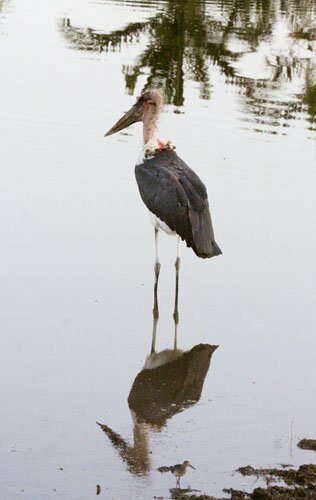 Dozens of ungainly Marabou Storks show up in trees around the waterholes, or on the wet shoreline. 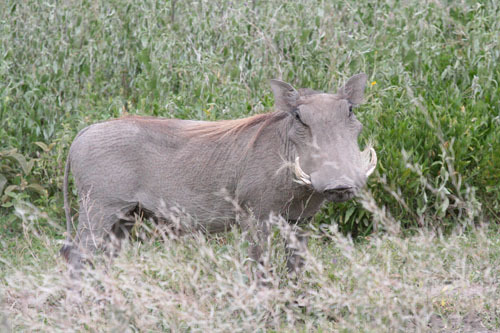 The predominant species are the Zebras and the Wildebeests. They number into the many thousands, with far more Zebras than Wildebeests seen today. They are noisy and nervous as they jostle toward and into the water, ready to plunge away, knowing that the Lions know they need to go there. A Zebra kill lies under a tree by a waterhole, with Lions nearby. 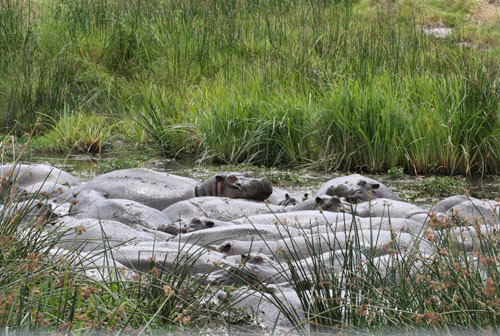 Hippos crowd into reeking water holes (sewers). The day grew long and we seemed to drive forever before jiggling over endless cow-paths and rocky, rutted stream crossings, to finally arrive at our Kensington Tented Camp. We were warmly received, and quickly found out why: we were the only guests. It felt a bit lonesome. Things did not go very well. The “shower” didn’t work, so, even after a long, hot, and dusty drive, we went without one that evening. The lights went out frequently. The water supply for the shower and the toilet (you don’t drink this water) malfunctioned. Dinner was good, and the staff tried their best to please. 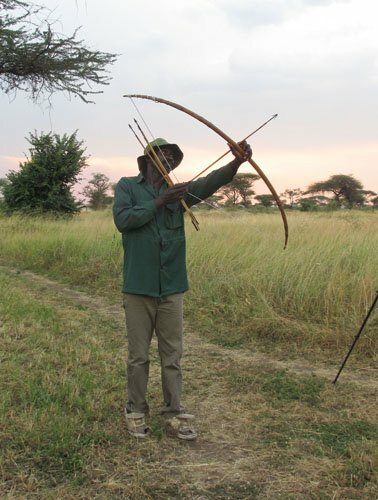 We felt well protected by the Camp Guard, but I am not convinced his weapon would stop a lion. We could hear the lions and hyenas roaring during the night. You don’t leave the tent at night without hailing a guard. A few large insects showed up on the floor of our tent. But, hey, it’s all in a day’s safari. The next morning, Day 8, dawned bright and beautiful and I worked on my bird list on the “veranda” while sipping the morning coffee that was brought to our tent. The water supply has been restored, so we got wet. After a very good breakfast, we were off again on the road through the local village, and toward the entrance to the Serengeti Park. The birding was very good along this road and we saw quite a few new birds as we poked along toward the Gate. Rollers, both Lilac Breasted and this Eurasian Roller, perch in conspicuous spots. Elephants are everywhere. 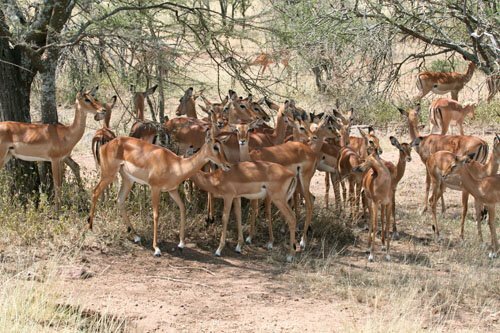 Impalas (boys and girls segregated) show off their lovely colors. 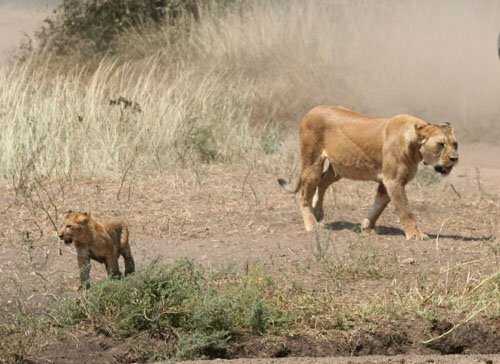 Lions, many with cubs, are quite common sights now. 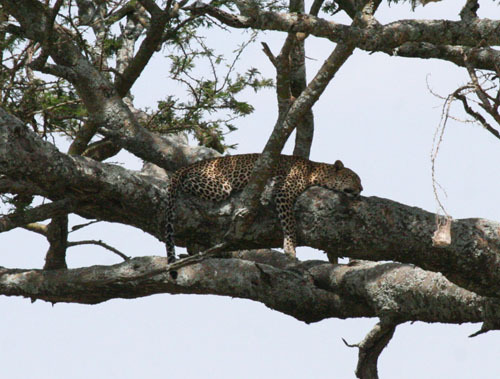 Later in the afternoon, we spot our first of several Leopards, always lounging in trees. We can’t completely neglect the birds. This Double Banded Plover makes a pretty picture. And, finally for the day, we cannot pass up the Vervet Monkeys. We endured another long and bumpy ride back to our Camp. Tonight there are two more guests there. The event of the night was a “cookout” in the wilderness away from the camp. First, Raymond got lost trying to find the way to the cookout. When we arrived at the designated tree, we were quite taken aback. The staff had set up a lovely “dining room” in the grass under the tree, with hanging lanterns, all in the middle of nowhere. We thoroughly enjoyed this bit of extravaganza. I can’t imagine how much work it all was for the camp staff. We got back to our tent quite late, exhausted from the long day on the dirt roads and the surprising ending.